Welcome to Paris, the city of light. This exuberant city is also known as the city of love, for its romantic atmosphere. Stroll through the boulevards, passing by the bridges to the Eiffel Tower as it lights up at night. Included is a three-night stay in Paris. Enjoy a guided tour that passes by landmarks such as Notre Dame Cathedral and the Arc de Triomphe. Continue exploring on a Seine River cruise that ends at the iconic Eiffel Tower. Visit the Louvre to witness the legendary Mona Lisa smile in-person, or perhaps venture below ground to explore Paris’ vast labyrinth of catacombs. Paris is at your fingertips, waiting to be seized, and the possibilities are limitless. This evening, enjoy a Parisian dinner. After breakfast transfer from Paris to Amsterdam and join your Emerald Waterways award-winning Star-Ship and be welcomed by your Captain and crew. This evening, enjoy your first dinner on board with your fellow travelers. Your Cruise Director will also conduct a port talk to review the activities and itinerary for the days ahead. This morning you will enjoy a glass top canal boat tour through Amsterdam’s canal. After the canal tour, enjoy free time to visit some of Amsterdam’s other famous attractions, such as the Rijks or Van Gogh Museums, or simply enjoy the lively atmosphere and watch the world go by. Tonight, the captain will be delighted to host a gala dinner. Seven markets transform picturesque Cologne into a winter wonderland over the Christmas period. Be sure to pay a visit to the stalls around the Alter Markt, Neumarkt, Rudolfplatz and the cathedral, beneath which you’ll locate the Christmas tree. Decorated mugs hold steaming hot Glühwein, and local vendors sell handmade sweets and local delicacies. Be sure not to miss the mesmerising ‘Stars at Night’ theme adopted around the Neumarkt, where looking up unveils a beautiful light display above your head. 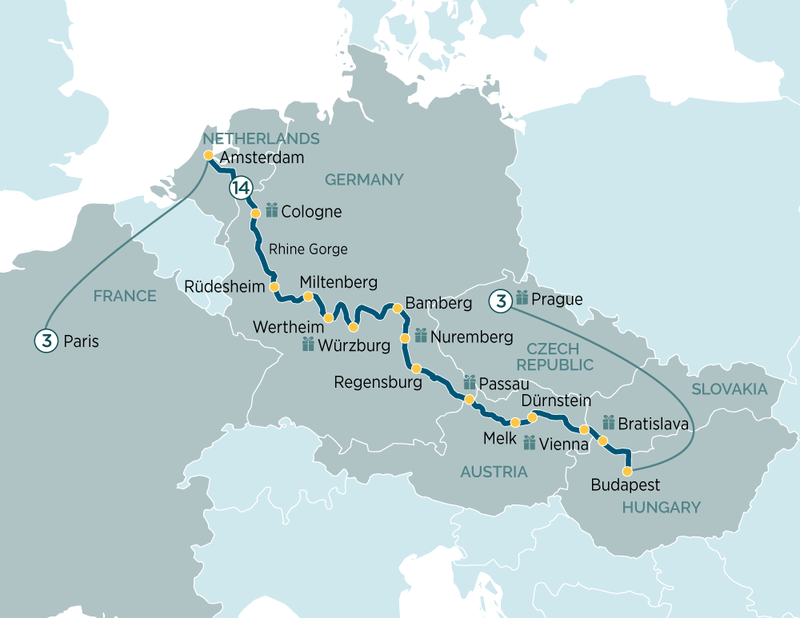 Today’s cruising will be a highlight of your trip, as we cruise through the spectacular Rhine Gorge. Keep your camera at the ready as around every bend there are stunning vistas of castles perched above steep vine–covered slopes. We will also pass the infamous Lorelei Rock where sailors are said to have been lured onto treacherous rocks by enchanted temptresses. We also pass the impressive Pfalzgrafenstein Castle which was formerly a toll gate perched on an island in the middle of the river. In the afternoon, we arrive in Rüdesheim, one of Germany’s most popular towns. You will visit the Siegfried’s Mechanical Musical Instrument Museum and in your free time, continue exploring and perhaps taste the famous “Rudesheimer Coffee”, made with Germany’s most famous brandy Asbach Uralt. Later in the day, experience a special on-board performance. Welcome to Miltenberg, a picturesque village on the Main River, which creates an imitable feeling of Bavarian life in medieval times due to the Old Town being lined with well-preserved half-timbered buildings. The gothic Merchant Hall is an impressive symbol of past affluence created by trade from river traffic. After your included tour of Miltenberg and free time, you will be transferred by coach to the stunning medieval glass-blowing town of Wertheim to enjoy free time until the ship arrives. Known as the “Pearl of the Romantic Road”, Würzburg is surrounded by sloping hills covered with vineyards. After breakfast, visit the Bishops’ Residenz, one of Germany’s largest and most ornate baroque palaces and a UNESCO World Heritage-listed site. Your tour highlights the palace’s unique staircase, elaborate 18th century frescoes and the amazing 3–dimensional stuccowork. Later in the day, experience a special onboard performance. Relax on-board this morning as we cruise to Bamberg. Feel the magic of the past as you explore this UNESCO World Heritage-listed city with your guide. Boasting one of Europe’s largest intact medieval town centres, Bamberg is bursting with character and charm. At the town centre is the largest preserved old quarter in Europe. Around 2,400 listed buildings and the centuries–old garden quarter form a special cultural heritage. Admire hundreds of building façades richly decorated in fascinating detail with spectacular ornamentation. Today you will have a sightseeing coach tour of the historic city of Nuremberg. Your coach tour would pass by the 900-year-old ramparts, the Justice Palace where the War Crimes Tribunal sat in 194, the Nazi party rally grounds, where rallies were held from 1933 until 1938. Nuremberg is also known for its Christmas market squares which you can visit in your free time. This morning takes you through the final stretch of the fascinating Main–Danube Canal to Kelheim. Continue cruising along the Danube River to UNESCO World Heritage-listed city of Regensburg, one of Germany’s best-preserved medieval cities. On our guided walking tour, you’ll have the chance to see one of the oldest bridges crossing the Danube and see the city’s architectural highlights including the Old Town Hall. Regensburg is also home to one of the loveliest’ Christmas market of the German-speaking countries. With its many quaint wooden stalls, the market is located around the Neupfarr Church and the city Guard House, adorned by row-upon-row of twinkling lights. Taste your way through the narrow streets and hidden passageways, picking up a mug of delicious Glühwein and treating yourself to homemade gingerbread and cookies. Cruise along the Danube this morning, in the afternoon we reach Passau. Cobblestone streets and graceful arcades welcome you in this beautiful city. On this afternoon’s walking tour, stroll through the old town’s narrow alleys and see the hilltop Oberhaus Fortress from the town below. Visit St. Stephen’s Cathedral, a wonderful example of Baroque architecture and home to Europe’s largest church organ with more than 17,000 pipes. Passau’s annual Christmas market, or Christkindlmarkt, takes place in front of the St. Stephan Cathedral. Around 70 gingerbread-like stalls selling festive souvenirs, handmade gifts and delicious treats are illuminated by strings of twinkling fairy lights, as the smell of Glühwein and fresh baking fills the cool air. Indulge on gingerbread as music groups and choirs take to the stage as the perfect accompaniment. Situated within Austria’s wine–growing region, Melk is home to the imposing UNESCO World Heritage-listed 900–year old Benedictine Melk Abbey. The Abbey features Austria’s finest Italian baroque architecture, with its ornate gold leaf walls, 640ft Imperial Corridor and fresco ceilings. Later, the ship sails through the spectacular UNESCO World Heritage-listed Wachau Valley and on to Dürnstein, one of the most enchanting villages of the Wachau wine region. This is the site of the castle where Richard the Lionheart was imprisoned after returning from the crusades in the 12th century. Welcome to Vienna, the capital of classical music. Today, you have a choice of either exploring Austria’s capital beginning with a drive along the magnificent Ringstrasse, where we will see the sights of the Vienna’s world-famous attractions such as the Opera House, Burgtheater, Town Hall, St. Stephen’s Cathedral and the Hofburg Imperial Palace. After the tour, enjoy your free time to sample the wonderful Christmas markets of Vienna which are set up in 15 different squares in the city. Set on the crossroads of ancient trade routes in the heart of Europe, Bratislava the capital of Slovakia, embodies various cultures – primarily Celtic, Roman and Slavic. Enjoy a sightseeing tour including the enchanting Old City with its Town Hall, Mirbach Palace and the Gothic Cathedral of St Martin. Bratislava also hosts charming Christmas markets throughout the city, which you can enjoy. This evening, the Captain will be delighted to welcome you to the Captain’s Gala Dinner. Budapest is Eastern Europe’s liveliest and most cosmopolitan city. Enjoy a guided bus tour passing by the Hungarian Parliament Building, the Buda Castle and the Chain Bridge linking Buda and Pest, amongst other fantastic sights. This evening, enjoy a Hungarian folk dancing and music performance on-board followed by a traditional Hungarian farewell dinner. After dinner, join your fellow travellers for a night–time cruise along the Danube, passing under the city’s numerous bridges. After breakfast, be transferred by coach from Budapest to Prague. Situated on the banks of the River Vltava in central Bohemia, this beautiful city is rich in history and is home to some of the world’s most pristine collections of architecture. Included is a three-night stay in Prague. This morning we explore the sights of the Old Town Square on a guided walking tour. We see Mozart´s Theatre, Little Square and Astronomical Clock. We continue our tour and walk across the Charles Bridge spanning the River Vltava and full of portrait artists and small vendors, to board our coach to drive to the 1,000–year–old Prague Castle area. With our local guide we walk through Hradcany Square, for the spectacle of the Changing of the Guard. See the magnificent Loreta Monastery, and arrive at Hradcany Castle. After breakfast this morning, you will be transferred to the airport to catch your onward or homebound flight. Get in the festive spirit as you navigate the width of Germany, the home of Christmas markets. Sip mulled wine and collect gifts as you enjoy the Rhine’s new wintery personality.